Alaska Air Seattle to San Diego and five days exercising the boat. Met brother Bernie again and we worked, cleaned, fixed, ate, drank, slept and checked the systems. I reviewed reefing the main. Bernie fixed the reefer thermostat. I spent a bundle getting the EPIRB maintenced with a new 5 year lithium battery and hydrostatic release. We hoisted the dinghy on deck. Saw fireworks and a rock band. 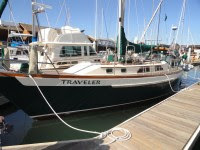 Traveler's Perkins 4-108 looks and runs great and mostly everything else necessary for a proper sea passage works well. We got to see the Travel lift hoist all sorts of boats out of the water including this 62 ft monster ketch that had leaking centerboard problems. And once again, I hauled myself out of bed, made my tea, jumped on a crowded bus and stood in the aisle all the way to the Convention Center station in downtown Seattle. Then I had a pretty nice one mile walk up the hill to work. When you are working a real 9-5 job, projects around the house just seem to stretch off into the distance as far as the eye can see. Weekends and week nights are not enough time. Oh well, I should be glad I have a job and that I have the time to ease into this sailing life. Now this guy in the picture above is already doing what he loves. 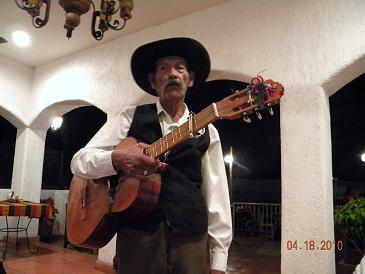 Old Pops here sided up to our table in La Paz last spring and sang us a few tunes before fleecing us of all our spare pesos. I want his job. What's left on the refit task list? Does the list just keep getting longer or is it actually getting shorter? Seems like as I tick items off the list there are always new ones going on the list. But assuredly, the major items, the important items are being resolved and we are now getting to the "nice to have" category, which we all know is optional, or maybe put-off-able. I'm including this picture here so that as you read this very dry list of boring tasks you can feel refreshed looking at this fresh picked lettuce, Connie's mysterious but smiling face, and a her stylish Sponge Bob Square Pants designer smock. Get engine serial number for Mexico permit. New hydrostatic release and battery for the epirb. 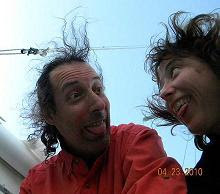 Purchase a bosun’s chair and windex then go up the mast to survey the rig and install the windex. Practice reefing the main, dropping the roller furler, rigging the staysail. All that silly sail handling nonsense. Replace the positive battery supply cable with a larger one. Re cable grounds from engine mount to battery box so my monitoring systems works for all loads. Replace some portlight window gaskets. Get rid of the old rusted outboard motor. Practice putting the dinghy on deck and deflating it. Experiment tying the dinghy to the davits. Measure boat, stem to stern and waterline to masthead. Take her out and exercise the engine and sails. New Single Side Band radio with antenna tuner and Pactor modem so we can receive grib files. Purchase and install a Hydrovane self-steering device. After an extended effort by Chingon fabricators the new exhaust is in place. They finally had to come to the boat, spot weld the connection in place, then take it back to the shop for finishing. Rebuilt alternator with good spare. Rebuilt starter/solenoid with good rebuilt spare. New water pump with good rebuilt spare. New hot water heater with new hoses to and from engine. Clean primary and secondary fuel filters.